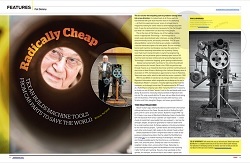 Pat Delany’s Open Source Machine Tools project is featured in Make Magazine #37! To learn more about the project, scroll through the projects below or check out the essential links to the right. Get involved! 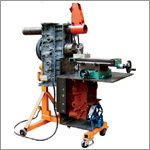 Join the 7000+ members of the Open Source Machine Tools Yahoo Group. Make anything? Just about: even complex parts like these. Our goal, simply stated: to help anyone, anywhere, build almost anything, using the stuff that’s already around them. We make essential machine tools — what people use to create essentially every manufactured item in our world — affordable to build with materials available in villages and urban slums everywhere, using open-source plans. This project is bottom-up rather than top-down: we want to help local artisans change their lives, their communities and their local economies. Learn more about our history and the idea of do-it-yourself global development, read the key documents behind our plans, get involved in this open source project, or click on any of the specific projects listed below. A re-discovered way to quickly make inexpensive but accurate machine tools for use in developing countries and in trade schools and shops everywhere. We made modern construction practical by replacing the original poured, non shrinking metal with cement grout. 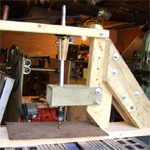 The original Open Source Machine Tools project, the MultiMachine works as a metalworking lathe and milling machine. Like the Concrete Lathe, it can be built by artisans and mechanics using materials (like junked cars) available throughout the world. 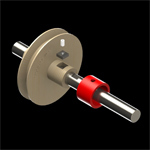 Designed to help spark village- and neighborhood-level manufacturing and equipment repair in the developing world. The world needs power! 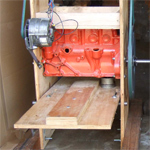 This design (Project Genny, or Africa Power and Light) is the first to turn an automobile alternator (from any junked car) into a practical, human-powered electrical generator. By operating a foot-powered treadle, people can use the generator to charge cell phones, power LED lighting or to run other open source machine tools. A common problem for artisans and mechanics in the Developing World: how to drill through hard steel, for instance to attach steel plowpoints to a wooden plow, without an expensive industrial-strength drill. 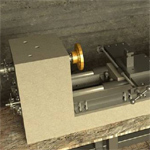 This new tool (based on an old idea) uses pressure and slow rotation to cut into hard metal. And, it can be built with wood and other materials available almost everywhere. We’re not sure what else to say about this, but it’s revolutionary: the “The Device” attaches wooden parts to a steel shaft. Vital for working with agricultural equipment and for improvising tools. A huge array of resources, including many DIY how-to articles from publications long out of print. Also includes instructional films on lathe and milling machine operation, basic shop techniques and specific metalworking skills.